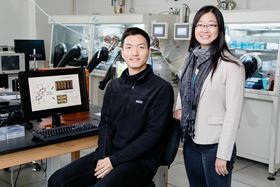 Illinois chemistry and biomolecular engineering professor Ying Diao (right) and graduate student Hyunjoong Chung (left) are part of a team that has identified a mechanism for triggering shape-memory in the organic crystals used in plastic electronics. Photo: L. Brian Stauffer. An international team of researchers has identified a mechanism that triggers shape-memory phenomena in the organic crystals used in plastic electronics. Shape-shifting structural materials have generally been made with metal alloys, but a new generation of economical printable plastic electronics is now poised to benefit from this phenomenon. Shape-memory materials science and plastic electronics technology, when merged, could open the door to advances in low-power electronics, medical electronics devices and multifunctional shape-memory materials. The researchers report their finding of shape-memory phenomenon in two organic semiconductor materials in a paper in Nature Communications. Devices like the expandable stents that open and unblock clogged human blood vessels take advantage of shape-memory technology. This involves physically deforming a material and then using heat, light and electrical signals, or mechanical forces, to trigger the material to expand, contract, bend and morph back to its original form, which can be done repeatedly. This effect works well with metals but remains elusive in synthetic organic materials because of the complexity of the molecules used to create them. "The shape-memory phenomenon is common in nature, but we are not really sure about nature's design rules at the molecular level," said Ying Diao, professor of chemical and biomolecular engineering at the University of Illinois at Urbana-Champaign and co-author of the paper. "Nature uses organic compounds that are very different from the metal alloys used in shape-memory materials on the market today. In naturally occurring shape-memory materials, the molecules transform cooperatively, meaning that they all move together during shape change. Otherwise, these materials would shatter and the shape change would not be reversible and ultrafast." The discovery of the shape-memory mechanism in synthetic organic materials was quite serendipitous, Diao said. The team accidentally created large organic crystals and was curious to find out how they would transform on exposure to heat. "We looked at the single crystals under a microscope and found that the transformation process is dramatically different than we expected," said graduate student and co-author Hyunjoong Chung. "We saw concerted movement of a whole layer of molecules sweeping through the crystal that seem to drive the shape-memory effect – something that is rarely observed in organic crystals and is therefore largely unexplored." This unexpected observation encouraged the team to explore the merger between shape-memory materials science and the field of organic electronics. "Today's electronics are dependent on transistors to switch on and off, which is a very energy-intensive process," Diao said. "If we can use the shape-memory effect in plastic semiconductors to modulate electronic properties in a cooperative manner, it would require very low energy input, potentially contributing to advancements in low-power and more efficient electronics." The team is currently using heat to demonstrate the shape-memory effect, but are experimenting with light waves, electrical fields and mechanical forces for future demonstrations. They are also exploring the molecular origin of the shape-memory mechanism by tweaking the molecular structure of their materials. "We have already found that changing just one atom in a molecule can significantly alter the phenomenon," Chung said. The researchers are very excited about the molecular cooperativity aspect discovered in this research and its potential application to the recent Nobel Prize-winning concept of molecular machines. "These molecules can change conformation cooperatively at the molecular level, and the small molecular structure change is amplified over millions of molecules to actuate large motion at the macroscopic scale," Diao said. Scientists have shown that repeated cycles of heating and cooling offer a cheap way to produce single-crystal metals.